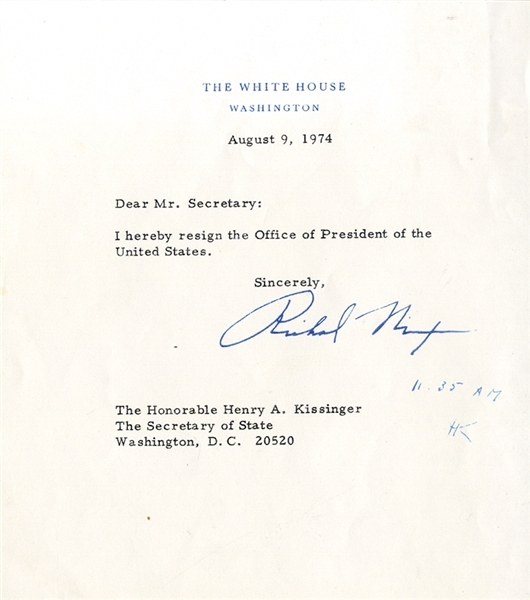 On White House Stationery, August 9, 1974, to Secretary of State Henry Kissinger is the typed resignation letter. In full, “Dear Mr. Secretary, I hereby resign the Office of President of the United States. Sincerely Richard Nixon.” It is also docketed at 11:35 AM, “HK”. The letter became effective when Secretary of State Henry Kissinger initialed it at 11:35 a.m. Nixon is the only President to resign that office.